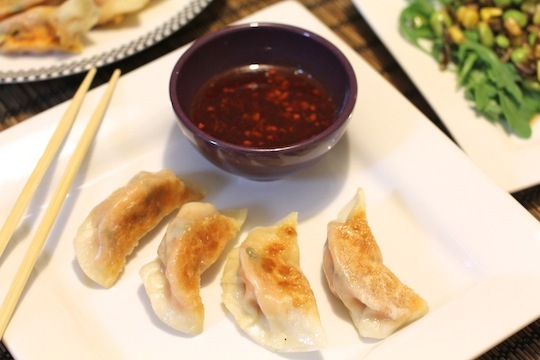 Hey, Lady Grey: Make Your Own Gyoza! 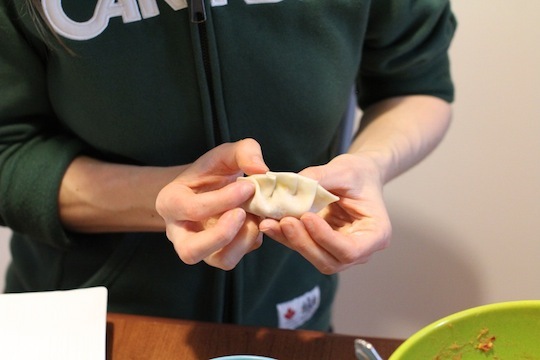 Making homemade gyoza is actually a lot of fun (in my opinion), and they taste amazing when made fresh. 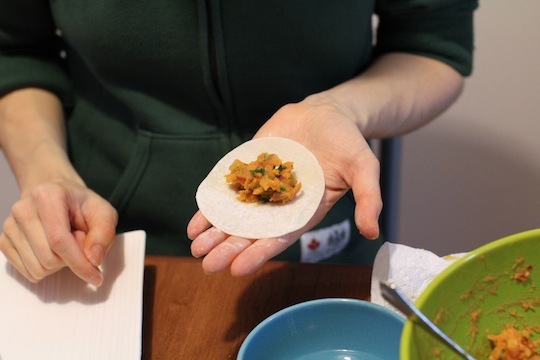 I made vegetarian gyoza with a sweet potato, cilantro & onion filling, but you can use almost anything. 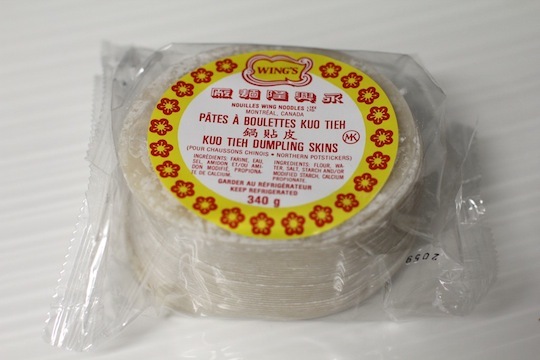 First of all you'll need to get your paws on some of these gyoza/dumpling skins. 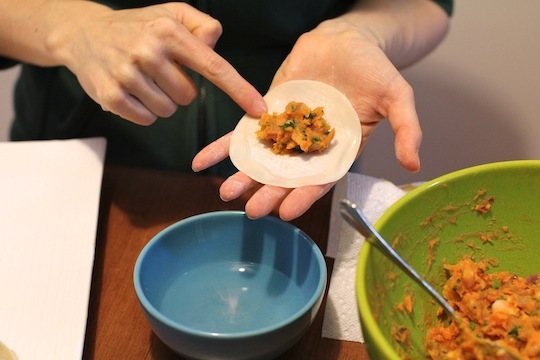 You can always make the patties from scratch, but this is just so much easier! 2 sweet potatoes, peeled and chopped into 1 cm cubes. Place them on an oiled oven tray and bake at 425 degrees until soft and cooked through (approximately 30 minutes). Then set aside to cool. 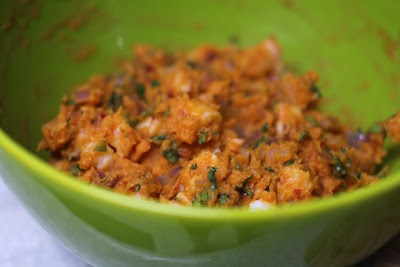 1 red onion + 1 clove of garlic, finely chopped and sautéed in a little olive oil until softened. 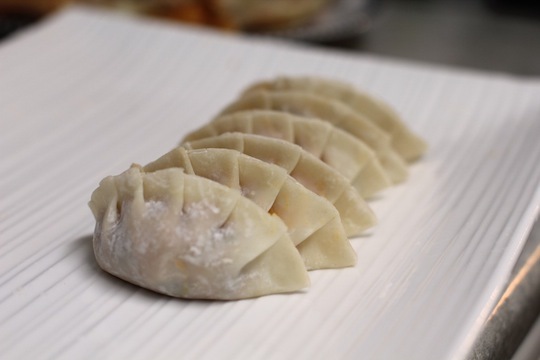 Now, you'll want to set up your mini gyoza production line... you'll need a bowl of cold water, your gyoza skins (defrosted if you bought them frozen), your bowl of filling, and a tray to place your assembled gyozas on. 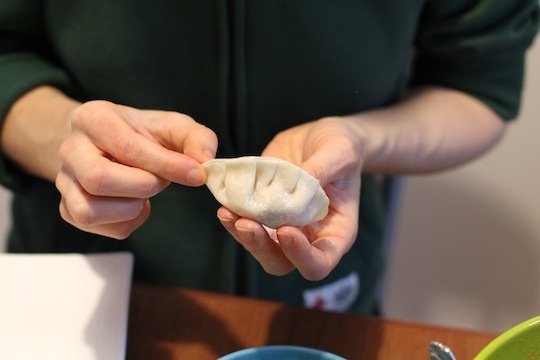 First take a gyoza skin in your palm and place a small spoonful of filling in the centre. You'll quickly learn how how much is too much. If you overstuff them, they are really hard to close. Less is more here! 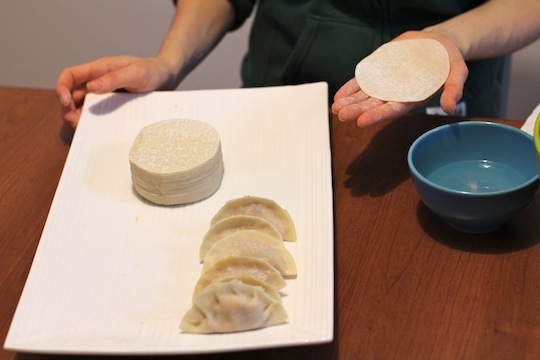 Next rub cold water generously all along the periphery of the gyoza skin to get it nice & sticky. 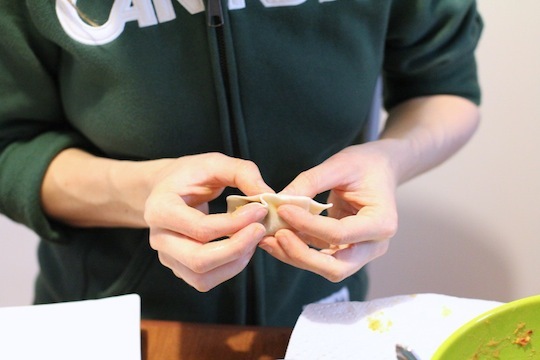 Then fold the gyoza skin in half, over the filling, and begin "crimping" one of the sides. 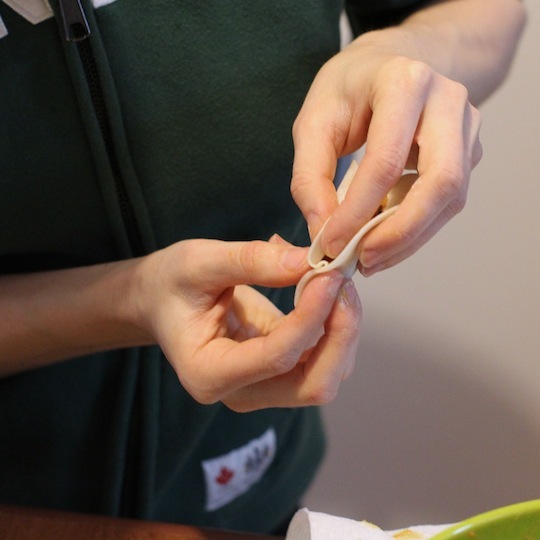 Make sure to press the edges firmly together so that the gyoza won't open up when cooking. Repeat as many times as desired! Now I'm sad to admit that I totally forgot to take pictures of the frying process... but it's easy. 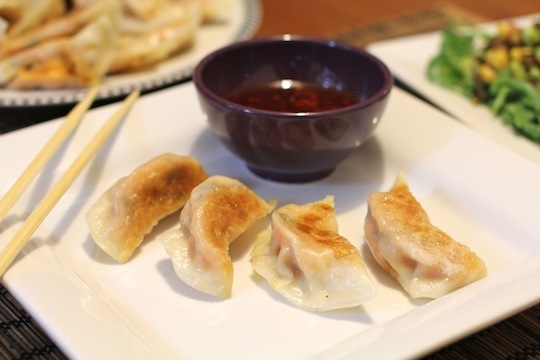 Heat a few tablespoons of oil over medium-high heat in a non-stick frying pan (one with a tight fitting lid available), then line the pan with a single layer of gyozas. Let them sit there for a minute or two until they are nice and brown on the bottom. Then pour in some fresh water (about a quarter inch of water in the bottom of the pan) and quickly cover with the lid. Let the gyozas steam in the water until it is all absorbed (a few minutes). Then place them on a plate, and repeat with another batch. 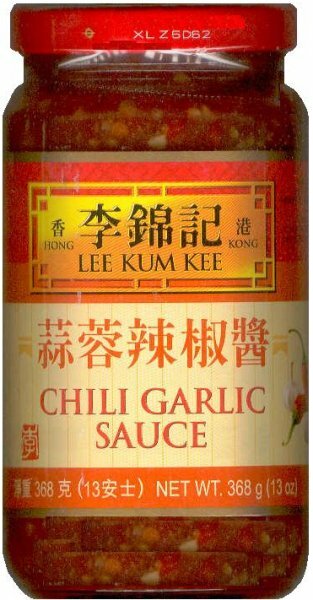 Serve them hot with any asian dipping sauce (the one I used was a mixture of soy sauce, rice vinegar, sugar, chili-garlic sauce and sesame oil). 1. Your food photography is amazing. Even in dark lighting it is awesome! 2. This looks like a ton of fun! 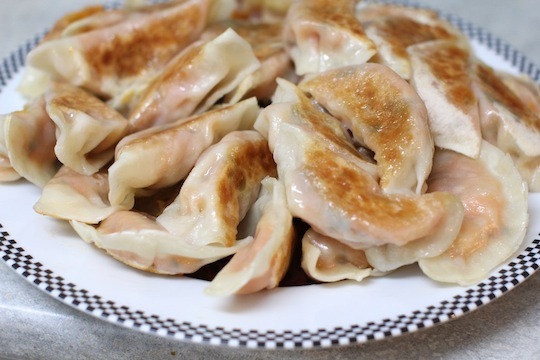 I'd love to have a little Gyoza party one day. Very inspiring! mmm, yummy! this is making me crave sashimi or dimsum. LOL. Thank you for a great tip and a great "how-to" guide! Oh yum, the ingredients sound delish; love sweet potatoes and cilantro! Thank you so much for sharing! Wow!! Thank you so much for this recipe. I really apreciate the step by step images. I am so impressed! These look perfect! These do indeed look delicious.... thank you so much for the recipe .... 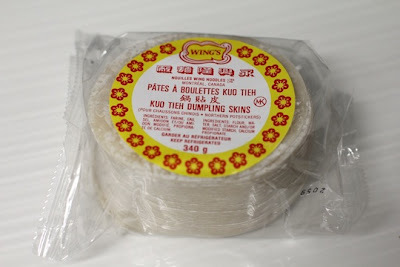 I can't wait to try them!